Every member in the team has their own role. We can distinguish plenty of them: Junior Developer, Senior Developer, Frontend, Backend, DevOps, SysAdmin – you name it. Each single role determines a member’s duties and permissions and is strictly based on the member’s skills. For instance, a Junior Developer shouldn’t have permissions to release the application to Production, but they should have permissions to deploy to the Dev server. 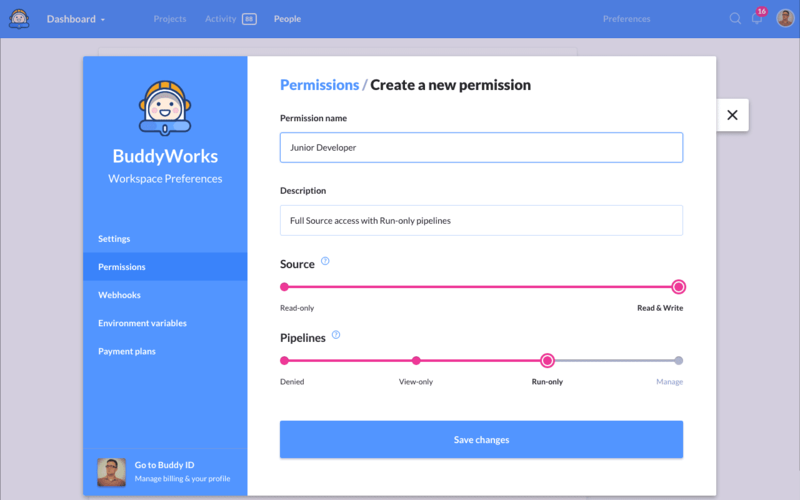 In this article, we’ll show you how to manage permissions in Buddy’s pipelines. 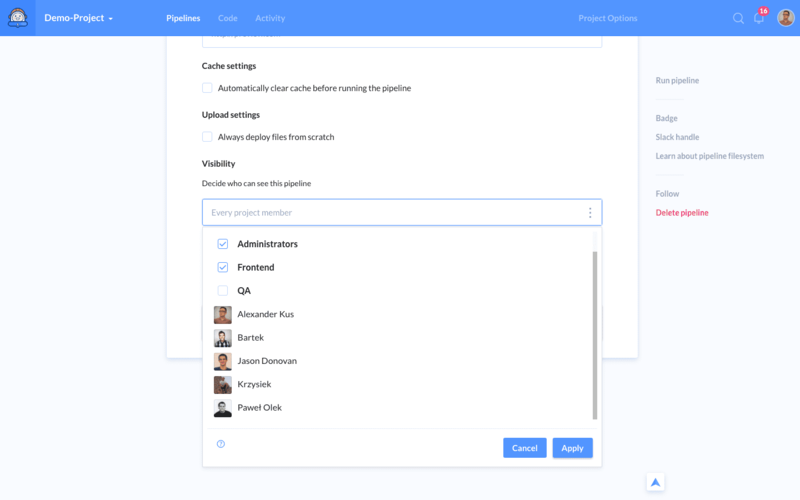 The Admin role grants access to all projects and pipelines in a given workspace. It’s not possible to restrict access permissions to the project for an admin, nor hide pipelines using the visibility. NOTE: Each workspace owner is assigned admin rights by default that cannot be changed. Only an administrator can give admin permissions to other users. There are two permissions defined by default in the workspace: Developer and Read-only. The first one allows for managing and running pipelines. The second one, as its name indicates, allows only to view the pipelines without the ability to add, edit or run them. NOTE: If you use Buddy as the hosting service in your projects, you can also define the level of Source access there. View-only - user can browse the executions in Pipelines, for example to check when was the last release to the Production server. However, they cannot run new executions. 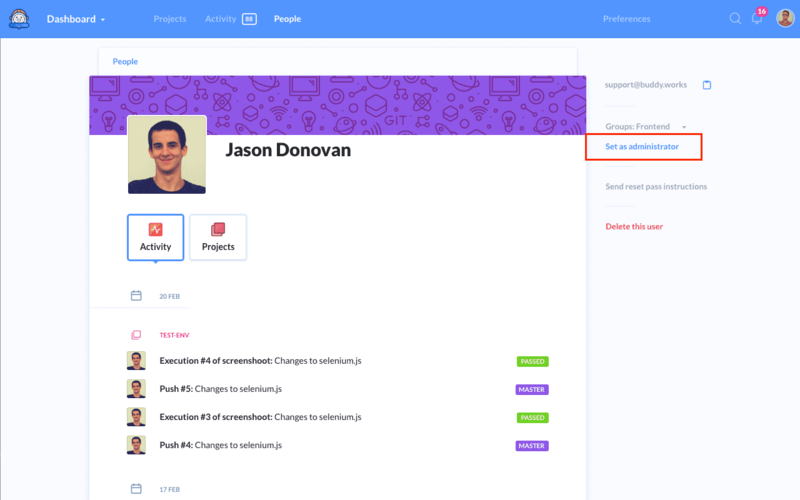 Manage - this access level gives full permissions to the Pipelines tab. A user with this access level has the same access to pipelines as the administrator. NOTE: An administrator has the Developer role set by default, which means that he has full rights in the project. It’s not possible to change permissions for the admin. Apart from permissions that define the access level to all pipelines in a given project, you can also set the Pipeline’s visibility. 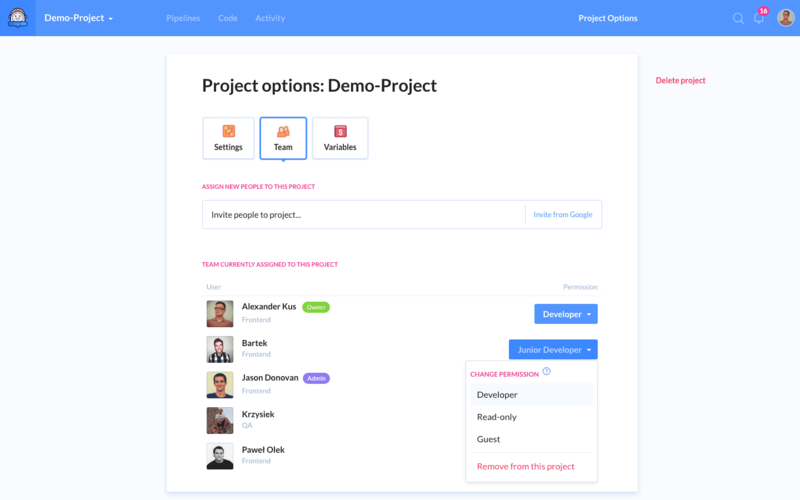 Thanks to that, you can restrict the pipeline’s visibility to a defined group of project members. NOTE: It’s not possible to restrict visibility for administrators. You can set various trigger modes in the pipelines: manual, on every push (automatic), and recurrent. However, if we use the automatic mode, the pipeline will be triggered after every single push, no matter if the user what permissions and visibility the user has. In short, the trigger mode has the highest priority of all. There is one person in the team that manages servers and pipelines: the Deployment Manager with the Manage access level. Apart from that, there’s the Senior Developer who can run manual deployments to the production server. However, she cannot edit the deployment scripts, because she has Run-only access level. The last one is a Junior Developer, who also has Run-only access level, but cannot see the production server, nor deploy to it (the server is hidden with visibility settings.